Cards by America: Its an ***ALL BLACK AND WHITE ONLY*** challenge at HM&F MC!! Its an ***ALL BLACK AND WHITE ONLY*** challenge at HM&F MC!! Eeeek! Welcome back Housey-Mousey Friends!! Yeap, you read that right! NO COLORS!!!! only ALL BLACK AND WHITE is allowed! The Challenge of doing B/W was supposed to be easy. Except for me! LOL!! This card literally took me like -forever- to create - since I soooo wanted to color in my image!.... After my zillionth attempt, I finally gave up and settled on heat embossing my Meeces with white ink and EP on BLACK CS instead. (had to go with the black BG to keep me from wanting to color them in! heheh). We proudly welcome back Di's Digi Downloads! Thank you for your continued support and amazing generosity!! The winner will receive a $10 voucher to Di's Digi Shop. 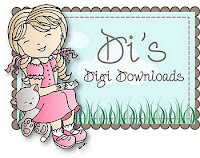 Di's Digi Downloads is a great little company offering lots of super adorable digi stamps! AND to add to the excitement of this *ALL BLACK AND WHITE CHALLENGE*, here's an a second HM&F prize offered by your CHALLENGE HOST, yours truly. 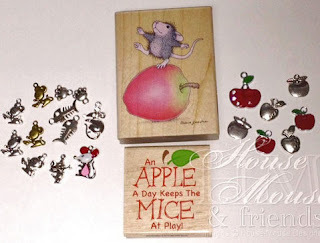 It's for a House-Mouse Designs Stamp called; "Bobbing on Apples", along with its matching sentiment called "Mice At Play" & some super cute Mice & Apple themed charms. WE HAVE 5 NEW amazingly TALENTED DESIGNERS that have joined our House-Mouse & Friends family. Please stop by the HM&F MC BLOG to congratulate them! To help inspire you to create your own *BLACK AND WHITE* Designs, check out the rest of the BLACK AND WHITE Stunners from the rest of the Team, HERE! Oh, and before I go..... I gotta tell ya to MARK YOUR CALENDARS FOR January 30th. 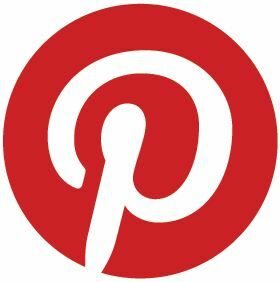 It's the day of our very first BLOG-HOP in 2012 !! You will want to join in the FUN and play along on that special challenge too because it will be FULL of excitement and SUPER PRIZES!! Chocolate, Coffee and Cards – Glitter. This is just too cool! And beautiful! America, you clever Miss you...white mice...Super cute card, love all the bling and the flower and the border! Fabulous! WOW I can't even tell you how AWESOME this looks!!! GORGEOUS card! Oh, I love it! The border is awesome and such fabulous bling. Hi America huni, I love your card - it is stunning!!!! The white on black is awesome, I actually did white sentiment on the inside - I am SO happy I didn't do white 'mousies' I should have but me to shame had to crawls my self away!!!!! I sat with my jaw fell open - inspired!! wow america gorgeous is this also your embossing. AWESOME take on the BW theme America cant think why you had a prob with it..but hey your designs are always jaw dropping love everything bout it. WOw gorgeous card! Thanks for playing at Designed 2 Delight this week! lovely black and white image love house mouse. Well this challenged pushed you over the edge America! Outstanding! Yep, your card was the talk of the House Mouse Yahoo group I belong to. Wow! Amazing!! The little meece look so neat embossed in white. Lovely details and the sparkle looks stunning against the black background. Beautiful! Love all the glitter and I know that in real life it is even prettier! Thanks for joining us at Sentimental Sundays! I'm so pleased to be working with you on the House Mouse team, this is a gorgeous B/W creation. Fabulous design. The white embossing is so effective. Wow, what an amazing idea. This is really beautiful and completely different. Thanks so much for joining us at Digi Doodle Shop Challenges this week. Good luck with the draw. It's so interesting idea this image to be in white and black! I just love it! Thanks for joining us this week at 2 Sisters Challenge Blog with this fab creation! America, this may be one of my favorite cards you have done! Wow! REALLY COOL CARD!!! I have never seen a house mouse done in just black & white, it look FAB! Love all the bling and you did a super job with our glitter challenge at CC&CC. So glad you played along, Aloha, Joanne. Such a wonderful card! I just love how you did the mice, i would never have guessed that the mice would be enough just embossed but it looks just terrific! You are simple the best! What a wonderful card America. This really is a very special card. It got wonderful! I guess I would realizied the topic like this. The little mice almost work as a negative. A gorgeos effect! And the design with all those rhinestones and glitter. Simply fantastic! Wow, stunning card. Black and white is always dramatic! Thanks for joining this week's challenge at Digi Doodle Shop. Stunning card , I have fallen in love with it! Awesome! Those Meeces look really good embossed white. Thank you for joining us at Sweet Stampin' this week. Fantastic card. Very creative. Thanks for sharing with us at Sassy Studio Designs for Dare To Be Sassy Thursday. Please join us again next week. America, Wow this card is outstanding. the bling looks TERRIFIC! Thanks so much for all of your inspiration. Oh my gosh, your meeces look all fuzzy in white and SO CUTE!! I like all the sparkly stuff going on, but the white on black really makes this image POP! Adorable! This is amazing.Thanks for joining us at The Alphabet Challenge. What a fabulous design, America! Love the special look to this black and white card. Very different, but love love love it! Gorgeous black & white card!! Thanks for joining us at the Alphabet Challenge! Very cool! The embossing is awesome and all the layers are beautiful. Wow - this is stunning! Those mice look wonderful in white! Stunning...absolutely stunning. Love the black and white combination!! Thanks for joining us at Sentimental Sundays. tough challenge, but you really nailed it with this cutie! Your card is FABULOUS! Love the BW color combo! Gorgeous card as always! I'm so thrilled to be joining in all the fun at the HM & F MC! Wow!! !This is gorgeous! Love the bling!